The DAX index rose 0.54% on Friday led by positive corporate earnings from Wall Street and a risk on mode fueled by China’s surge in trade surplus data which points to improving economic conditions in the world’s second largest economy. With no major economic releases from the Eurozone today, Wall Street’s earnings reports will be in focus and influence price action on the DAX while concerns over global growth continue to linger in the face of the prolonged US-China trade dispute and Brexit’s lack of direction. The DAX ended at 11999 on Friday, shy of the 12000 mark and is looking to overcome this month’s high around 12030. 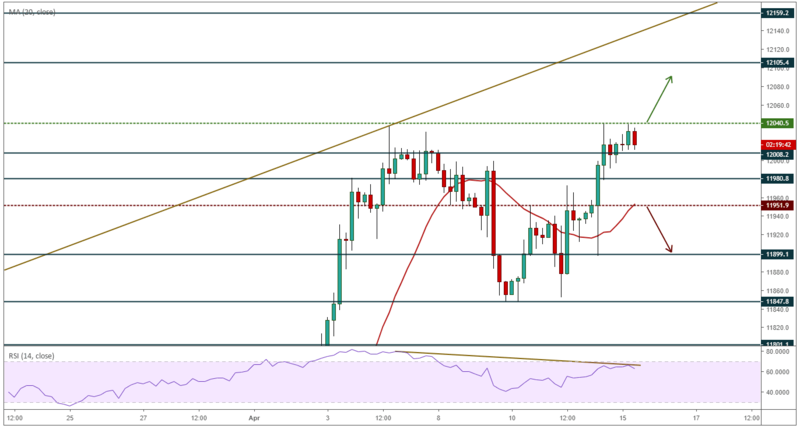 The RSI reading has so far failed to form a higher high corresponding with price action which may be an indication that the index could turn lower since reaching Friday’s high at 12040. Failure to hold above the support at 11950 would drive the index towards the strong support at 11850. Alternately, should price manage to hold above 11950 the bullish view persists and the bulls are challenged to break through the resistance zone of 12030/12040 to take the DAX higher.